ridemax blog – Page 25 – more magic. less wait. I wanted to share a nice RideMax review I stumbled into today. Thanks, Ginger, and enjoy! UEA Break at Disneyland: RideMax Tips! 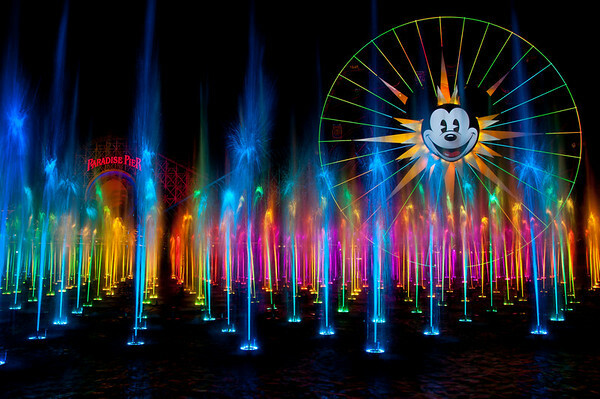 World of Color - Disneyland Resort's New Show! For those wondering, “UEA” stands for the Utah Education Association, which typically holds its annual convention on a Thursday and Friday in October. Schools in Utah normally close for the convention, making a perfect excuse for many Utahns Escaping to Anaheim! The UEA break this year is October 20-21. Though not as crowded as spring break or Christmas week, UEA does bring some extra crowds into the park, with some folks even leaving town early and arriving before the official break begins on Thursday. Tip #1: Arrive early in the morning. You’d be surprised at how much time you can save in line by simply arriving at Disneyland in time to be among the first guests entering the park for the day. First (and most obvious), the lines for some of the popular attractions are at their shortest of the entire day first thing in the morning. Some folks mistakenly believe they can make up for this by staying late into the evening, and to some extent this is true, but don’t be surprised if you still see an hour-long posted wait for Splash Mountain at 10:00pm! Clearly, arriving early is still better than staying late if you’re trying to avoid the crowds. 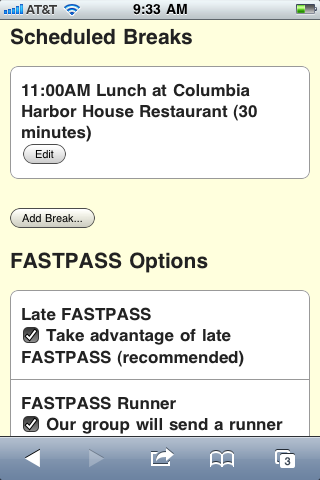 The other reason for arriving early is that you can get much better use of Disney’s FastPass system early in the day. Consider that first thing in the morning, once you have obtained one FastPass, you are allowed to obtain another one in as little as 40 minutes or so after obtaining the first one. Contrast this with later in the day, when you may have to wait two hours before obtaining the next one, or worse, FastPass may even be gone for the day for some of the more popular attractions (Star Tours, anyone?)! 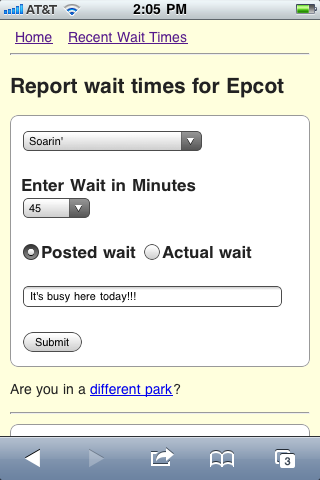 Tip #2: Maximize your use of FastPass! Even though FastPass has been in use at Disney’s parks for over 10 years now, it’s amazing that some guests still seem to think Disney charges for this service, or don’t know how to get the most from the FastPass system. 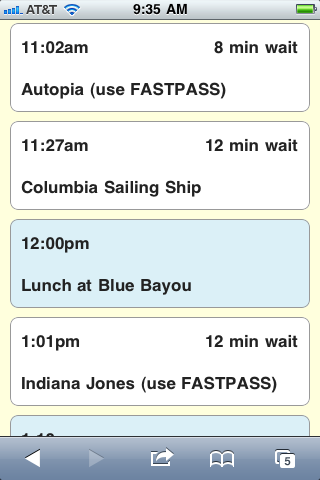 So let me emphasize this point: FastPass is FREE, and it can save you a lot of time in line! Once you obtain that first FastPass of the day, make a mental note of the time at which you can obtain your next one (this time will be indicated at the bottom of your first FastPass ticket). Then when that time draws near, send a “runner” from your group over to obtain your next FastPass ticket, and continue this process throughout the day. The RideMax for Disneyland planner can help you prioritize which FastPasses to obtain first (and we’ve reserved at least one Disneyland FastPass “trick” for our subscribers), but even without the software you can save time in line by carefully noting the time at which you can obtain your next FastPass, and gathering them accordingly. If you follow this last bit of advice, who knows? You might be surprised to find that the kids enjoy the hotel pool almost as much as they enjoy the park itself! 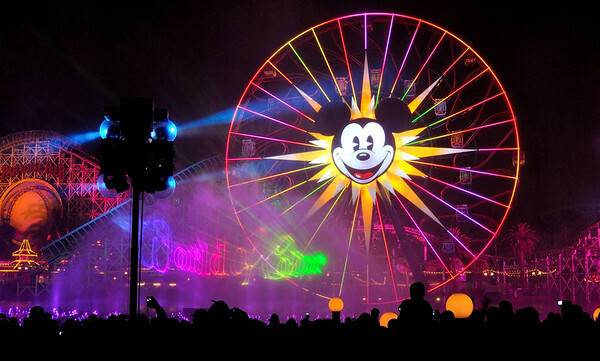 Author Mark WintersPosted on October 12, 2011 March 31, 2012 Categories Crowds, Disneyland, FASTPASS, RideMax1 Comment on UEA Break at Disneyland: RideMax Tips! We recently received a trip report from a repeat RideMax customer from Kefar Saba, Israel. We’ve copied his report here in it’s entirety (with minor editing adjustments). Let me start my story at the beginning – 23 years ago. In the summer of 1988, my wife (my girlfriend back then) and I visited Disneyland. Although we had fun, the most prominent memory we have from that visit was waiting in endless lines – sometimes up to an hour (and if we remember correctly, even an hour and a half for one attraction). In fact, during our first day, we wanted to ride the “Star Tours” attraction, and the sign posted there claimed that the wait will be 2 hours. Since we didn’t want to wait that much, and we were planning to come back the next day in any case, we returned the following day early in the morning, and were among the crowd waiting at the end of Main street for the rope to drop (at 9:00am, I think). When the rope dropped, we ran towards the “Star tours” attraction – as did everybody else there; We ended up waiting “only” 45 minutes. The next chapter in the story takes place during July 2009 – when we went on a family vacation (we are now with 3 children) in the USA, including several days in Walt Disney World. We dreaded the expected lines, and I started to look for some tips on how to get the most out of a visit to WDW – that is when I first heard of RideMax, and decided to purchase it. Needless to say, the results were great – our waiting time was minimal for almost all rides, and we succeeded in doing everything we planned (and then some more). The final chapter (in the meantime), is the family vacation we went on last month, including a visit to Disneyland and California Adventure on July 11th and 13th 2011. Of course, I decided to use RideMax once again, as the challenge in visiting Disneyland seemed to be greater than the parks in Disney World. Once again, the results were fantastic – we were able to do almost everything we planned to (21 rides, three shows during the afternoon and two shows in the evening), and even succeeded in riding Indiana Jones and Space Mountain twice, and Big Thunder Mountain Railroad three times, all in one day, without waiting in line more than 15-20 minutes, and usually much less. To be honest, during the planning we ended up eliminated in advance the peter pan ride, as the projected wait time was too long for us (more than 30 minutes – RideMax “spoiled” us) and during the day at Disneyland, we decided to skip “Finding Nemo Submarines” as the standby wait time was more than 40 minutes (as projected by Ridemax). The same goes for our visit at California Adventure – we were usually ahead of plan, hardly waited in line (except for Toy Story Mania – for which the wait is inevitable), and did the “Goofy’s Sky School” twice and “California Screamin’ Roller Coaster” three times. But in addition to the planning that RideMax does – taking FastPasses in the correct order, allowing us to maximize the number of FastPasses we collected during the day, scheduling rides at times that there was little to no wait at all, while the same rides had standby lines of 30 minutes or more during other times of the day, the tips the came with RideMax were very helpful – in particular the tips on arriving early and how to plan the arrival (my Wife and kids initially wanted to “kill” me for forcing them to wake up at 6:30am in order to be at the gates no later than 7:20am, but ended up thanking me for doing so) and the tips about the shows and parades (where the best location to view them is, when to arrive for them, how to get a ticket for World of Color). So once again – I can say without any hesitation: RideMax is worth every cent it costs (and then some more), and I recommend it to anybody planning a visit to Disney’s parks. In fact, I have a feeling that more and more people are using it – during our visit in Disneyland, we met two families that also had RideMax plans in their hands (and had some time to exchange views on this – not too much time, as this was during our waiting in lines, which as noted was usually very short), and another person who saw our plan and asked if it was “from that software that plans the visit”. Thank you very much, and keep up the good work. Thanks to this customer for sharing his RideMax experience. We’re glad he had such a nice trip, and that RideMax could help! 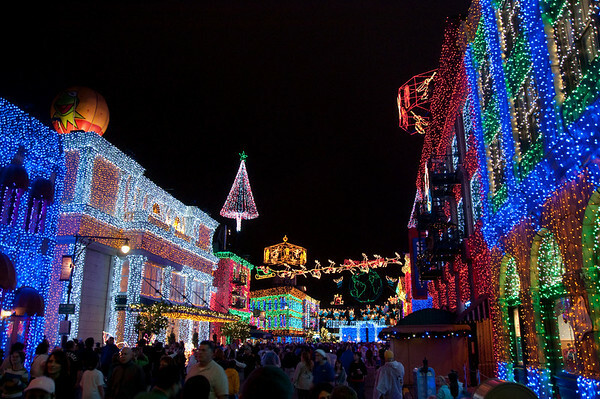 The Christmas lights at Hollywood Studios -- Amazing! For those planning a December trip to Disney World, December dates are now available in RideMax. Based on our experience from previous years, we still expect several changes in park hours from Disney, especially during Christmas week itself. We wouldn’t be at all surprised to see 8:00am openings at the Magic Kingdom — that’s a 7:00am Extra Magic Hour!